"Huntsville, AL – Remington Arms Company, LLC, (“Remington”) is pleased to announce that the V3 Field Sport Walnut is now shipping and available at retailers, dealers and distributors across the country. The V3 shotgun blends Remington’s legendary pointability with the reliability of the revolutionary VersaPort gas system in a compact and lightweight platform. A match only made in America. The Remington V3 flawlessly cycles all 2 ¾ to 3-inch 12 gauge loads while reducing recoil to a level previously unheard of in autoloaders. For traditional good looks, the V3 is now available with American walnut woodwork and rich satin finish. The V3 Field Sport –the new 3-inch chambered, American designed and built shotgun that represents the return of America’s greatness in autoloading shotguns. The Remington V3 Field Sport is also available in black synthetic and camo versions. All V3 shotguns ship with three screw-in Remchokes (Improved, Modified, and Full chokes). The V3 shotgun is the new American autoloader, from Remington. The Remington V3 Field Sport Walnut is available in both 28 and 26-inch barrels with a MSRP of $995." Actual street price on the V3 Walnut is a very appealing $775 or so, coming in at far less than you can expect to pay for other walnut stocked autoloaders. The 3 inch Browning Maxus Hunter is $1549.99 MSRP, the Winchester SX3 Field is $1069.99, the Benelli Ethos is $1999.99 - $2199, the Beretta A400 Action retails for $1600 - $1700, and so it goes. The V3 Walnut is the only one of the bunch that has a written lifetime warranty, has a Full choke that can be used with steel, and it is the softest shooting autoloader as well. If anything, the V3 Walnut is even softer-shooting than the V3 synthetic models, for it weighs a quarter pound more: my example is right at 7-1/4 pounds, as measured by calibrated digital gauge. The V3 Walnut model's trigger is also outstandingly good, breaking at a crisp 4 lbs., 6 oz., one of the best triggers I've tested on a field autoloader in quite some time. For comparison, from my previous reviews, the Maxus had a 6 lbs. trigger, the Benelli Vinci was at 5 lbs., the A400 was at 4-3/4 lbs., the Benelli Ethos trigger was at 6-1/4 lbs., and the Winchester SX3's trigger broke at a bit over 6-3/4 lbs. The backstory on the V3 Walnut is this: Remington was close to releasing the V3 Walnut a year ago when the V3 synthetic and synthetic camo versions were released. During extended torture-testing of the V3 walnut Remington managed to crack some forearms. As a result, Remington directed their design teams to come up with options to eliminate this. It resulted in tube extensions to the gas system, as shown above. The exhaust gas vents at the barrel ring. 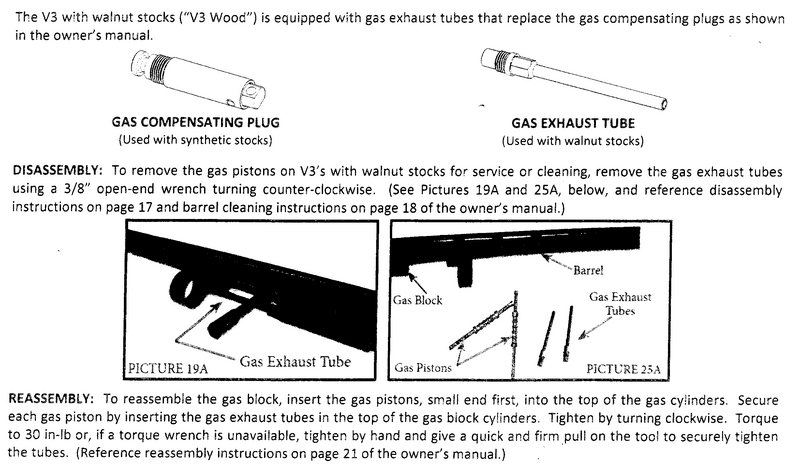 The differences between the synthetic model gas plugs and the walnut model exhaust tubes are shown below. The very cleanly-machined walnut forearm provides generous gas venting areas, well in front of the shooter, with no unwanted stress to the forearm itself. Like all of the current V3 models, the receiver is drilled and tapped for optics if desired for turkey, buckshot, or slug use. The V3 uses the same Weaver-style base as the Remington Versa Max. Then, the torture-testing began all over again to make sure that the new forearm design eliminated issues, and that took time. Along the way, there was a debate about recoil pads. Originally, the V3 walnut was going to come equipped with a conventional vented, ground recoil pad. But, the Remington V3 was designed to be the most reliable, softest-shooting on the planet, and both the Versa Port action and the SuperCell recoil pad were needed to assume that mantle. While nothing beats a ground pad as far as fit, as far as I'm concerned, Remington decided to use ceramic guides to tighten the tolerances on their finished walnut stocks, and also ordered brand new tooling to tighten their tolerances on their popular SuperCell pads as well. That too took time and money, but everyone appreciates a pillow-soft shooting firearm: and the more you shoot, the more you appreciate it. The walnut forearm does feel a bit bulkier than the synthetic forearm, but Remington has machined in finger grooves at the top so it not only feels good, but it fills out the hand nicely. The cut checking on the forearm is essentially wrap-around, as you can see above, and really grips the hand well, as does the checkering on the pistol grip. The forearm fits rock solidly; there is no rattle or unwanted movement at all. The walnut in general is not touted as high grade at all, but it is better than I would expect at this price point, for the V3 Walnut costs no more than the camo models. I do like the very solid feel and grip of the forearm, for when swinging a shotgun most of the steering is done with the forearm. The way all Remington V3 models are made in Ilion, New York, is that after the proof-testing, each V3 is function-fired with four rounds of target loads, then with four rounds of heavy loads.You've probably read or heard somewhere that you are supposed to tear into a new gun and out all that "nasty preservative grease and stuff." That is not the case with the V3, it is a waste of time, for Remington uses Breakfree CLP as the factory lube and preservative. Remington may well be switching to their new Rem Oil PRO3 in the future, but regardless . . . there is nothing you need to obsess about getting out of the action. In the lastest round of Remington's endurance testing, numerous V3 shotguns were taken past 7500 rounds with zero attention to the Versa Port gas pistons. I like the 26 inch barrel as is on the V3 Walnut, but I would like a 24 inch barrel for flushing game or in the turkey blind on both the synthetic and the walnut. Flip-side, I can tell you that the 28 inch barrel does just fine in the goose pit and duck-blind, but my general preference would still be the 26 inch. Shoulder them both and decide for yourself what you prefer, for barrel length remains more personal preference than anything else up to a point. Based on the excellent trigger, the steady feel, smooth swing, and remarkably light recoil, the Remington V3 Walnut is ready for a lot of fun on the clays course (and just about everything else) just as supplied, right out of the box. More to follow in Part Two.